In November 2013 I had the joy & excitement of looking out of an aeroplane window & seeing once again the majestic & beautiful sight of the Himalayas as we approached Tribhuvan airport, Kathmandu. 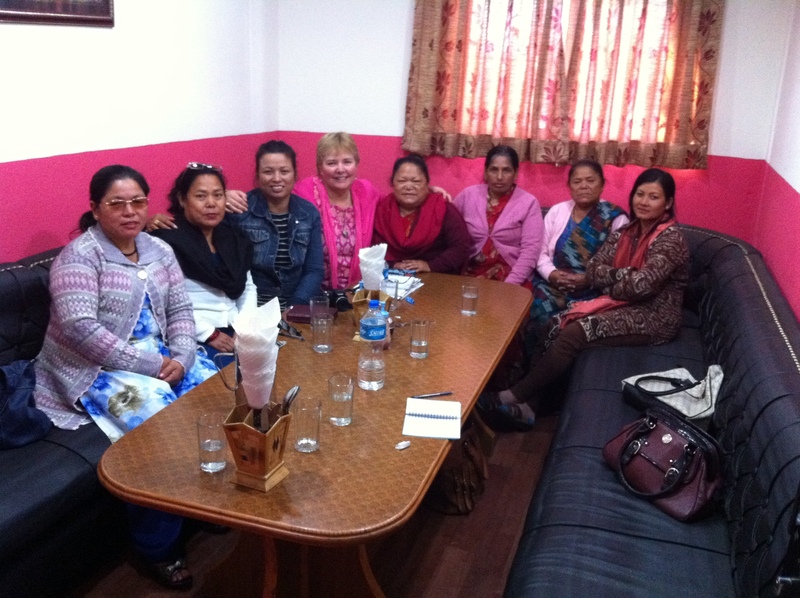 I was returning after 2 years to spend 2 weeks with the ladies that WWR supports. Bina met me at the airport & it seemed like 2 months not 2 years since I had seen her! laughter with them. One of my favourite photos is of myself with Dhan Kumari (at the bottom of this page). If ever I am feeling down I will look at this photo as seeing the laughter captured in this moment, you cannot help but smile! 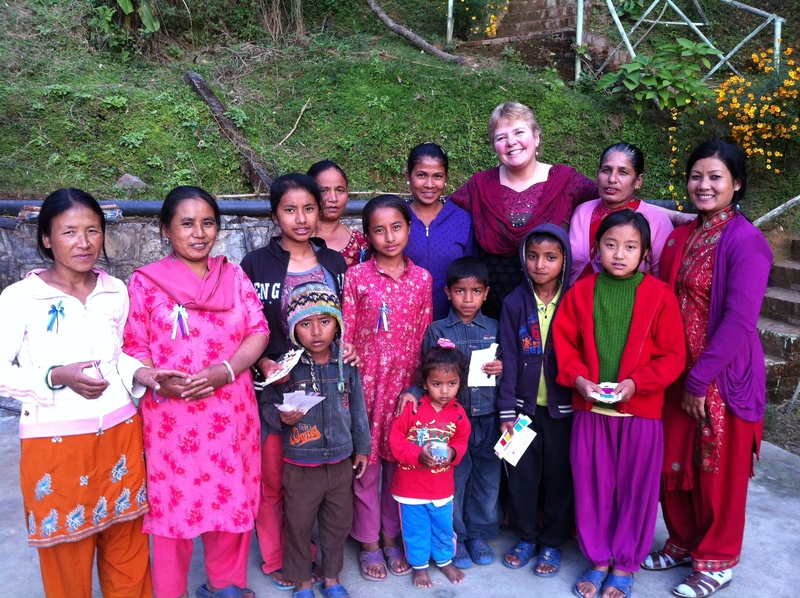 I shared lunch with some ladies who are Board members of WWR in Nepal, & led a bible study on the book of Ruth with them, looking at the characters of Ruth, Naomi & Boaz. We spent several hours talking & sharing about what we can learn from these Godly characters. We met in a KFC restaurant – not KFC as we know it, this was the Kings food cafe! The room we were shown into was called the King’s Family Room – written above the door in English! I pointed out how appropriate this was, as that is what we were! I had a yummy dish of vegetable noodles for 70 Rs – 45p! in that room! 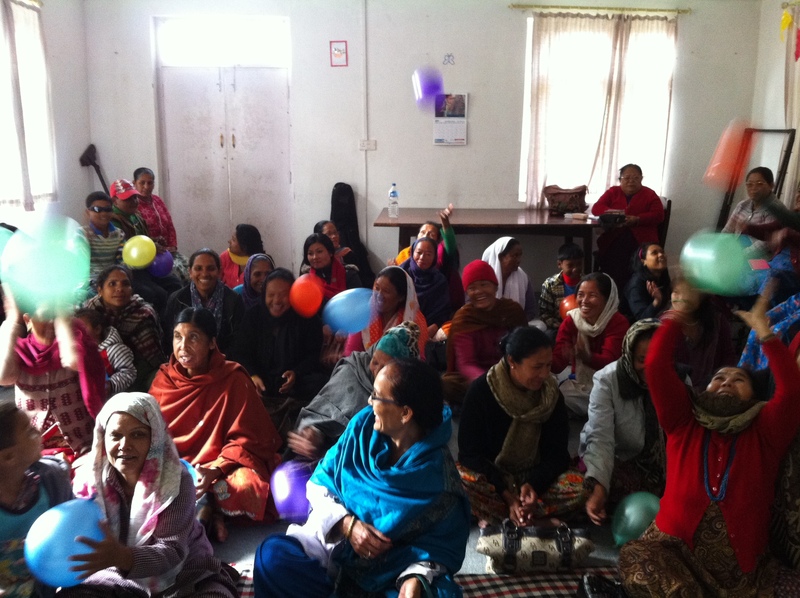 It was a wonderful day, many of the women WWR supports from Kathmandu city were bused up to Grace Home to enjoy the day. 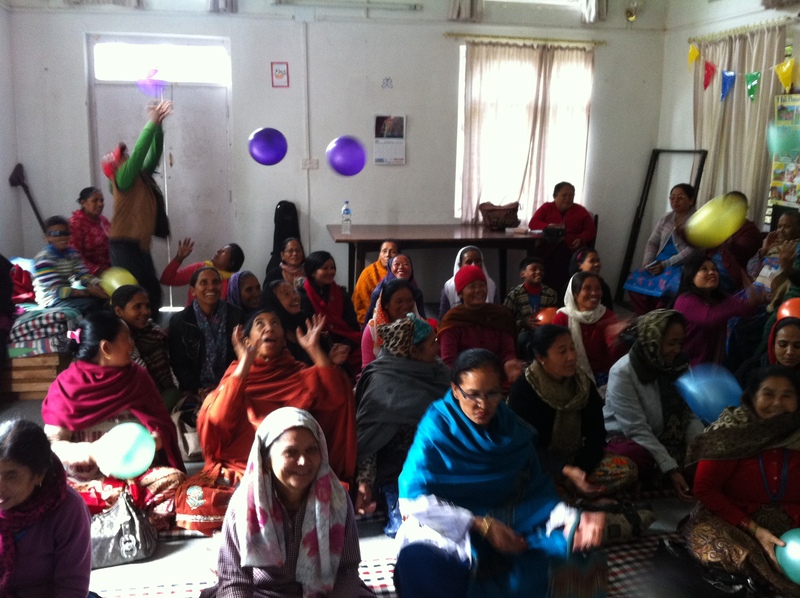 I had brought lots of balloons for the children, but at the start of the day I threw them out among the women, & it was such a joy to see them laughing & having fun patting them around as my photo clearly shows! 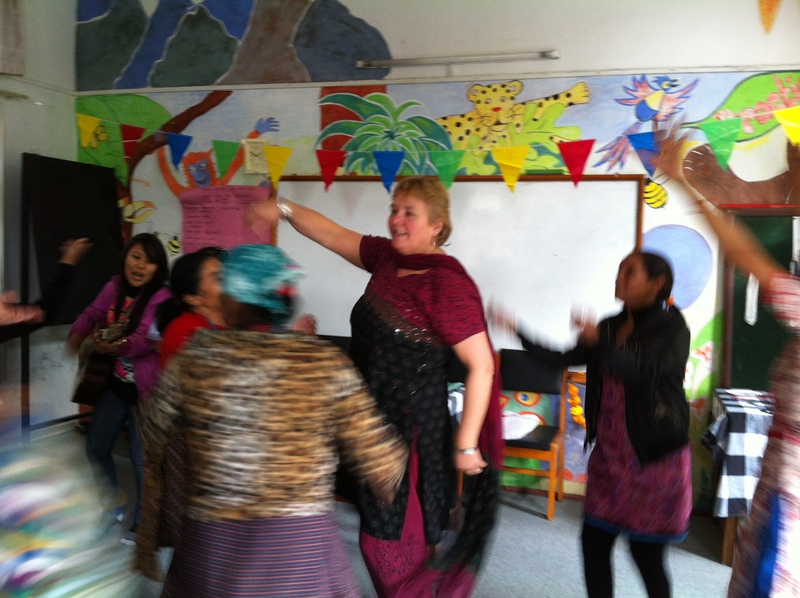 There was much singing & dancing & we enjoyed a delicious lunch. I also did a couple of talks, one before lunch on the parable of the persistent widow, & we ended the day with a talk on 1 Peter 2v9, reminding the women that they are indeed chosen by a loving God and are His special possession. 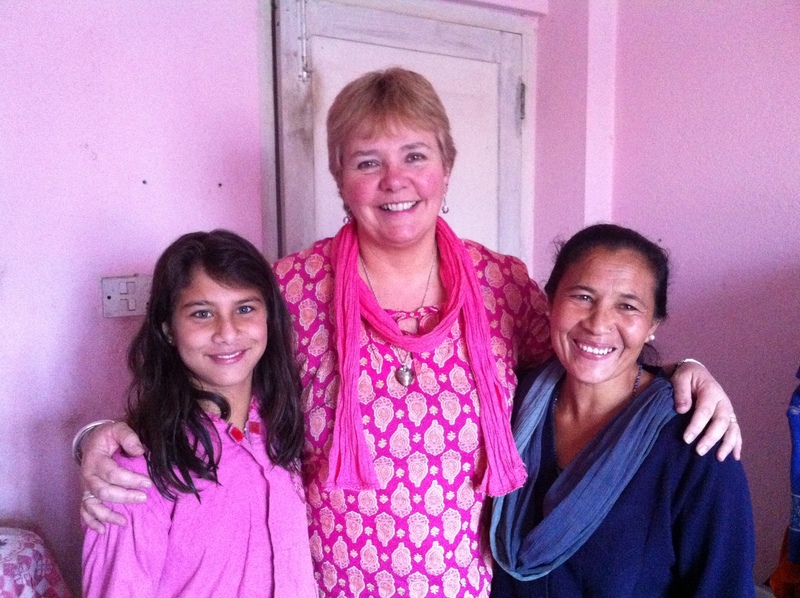 I have to mention here the wonderful job Shristi did of translating – thank you Shristi! Many months before this trip, God laid on my heart some verses from Numbers 15 v37-41. I knew that I had to make some little broaches with pretty blue ribbons attached to give to each lady to remind them that they are God’s chosen people, to obey Him, and that He is The Lord their God. I discussed with Anna T how many I should make & we decided on 45 – 50. I spent many hours sewing 3inch lengths of varying shades & designs of thin blue ribbon, held together by a little blue heart button & blue bow & attached to a broach fixing. I made 50 & kept going…I made 60 & kept going …I made 70 & for some reason felt this would be enough! On the celebration day I looked around the room feeling a little disappointed that I would be taking about 20 blue ribbon broaches home with me. I closed the day by reading the verses from Numbers & explaining to the ladies why I had felt God had wanted me to give them each one. I handed them to the ladies one by one & prayed a blessing on them. One lady asked if she could have one for her son. Another asked if she could have 3 for her daughters. Another wanted one for her sister….and so it went on! I’m sure as you are reading this you know how this story ends! Yes! I needed 70 ! What an amazing God we have who goes before us, who knew I would need 70, who takes care of the little things in our lives as well as the big things in this world! And so it was time to say goodbye to so many beautiful women who hold a special place in my heart. 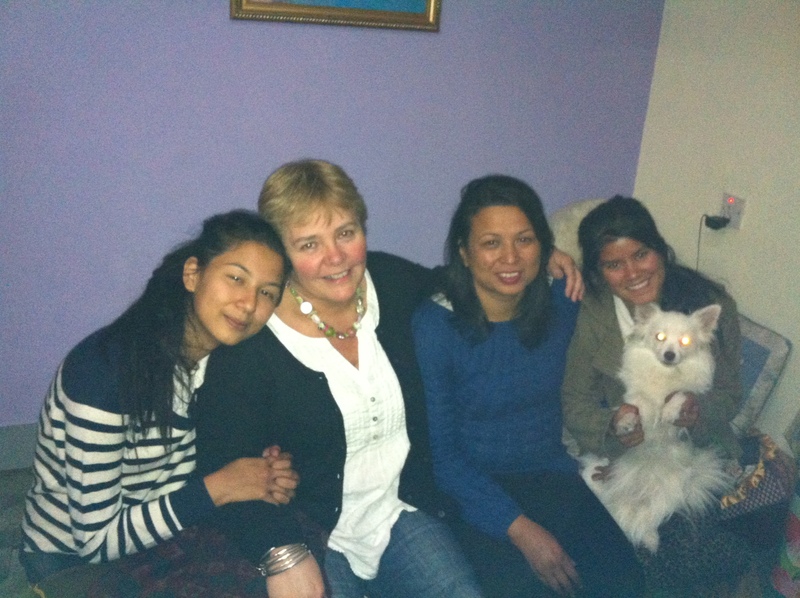 I sadly said my farewells to Bina & her lovely family who looked after me so well – my family in Nepal. 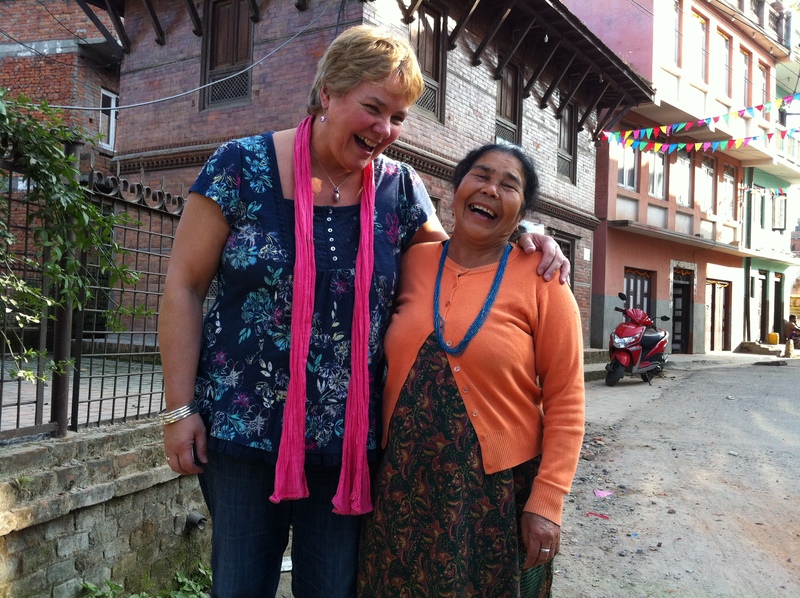 I was headed again for Tribhuvan airport with a full heart & many wonderful memories.